This is the time of year where you see so many rejoicing at the end of school. People have been asking my kids what they have planned for summer, and are always surprised when my kids reply that we school year round with only short breaks. Many moms can’t imagine why we would choose to not take a single, long break of several months. My two will be in 7th and 9th grade this coming Fall. We have done a lot of unschooling in the past, but my two have decided they wish to use more formal curriculum and co-op classes, so that is the direction we are moving in for them. Both wish to attend college, and start dual enrollment at 16. Our county offers that program for homeschoolers and between that and in-state tuition at the local university, both will be able to get a stellar college education without going into debt. We run our school years from July 1st to June 30th due to North Carolina’s homeschooling laws dividing a school year by these dates. Our state requires end of grade testing each year, so we complete our testing in the middle of June then take two weeks off before starting again. Our state requires 180 days of school a year, but we tend to complete 225 or more a year using this system. As a result, the kids get the same amount of work done or more, but are less stressed with heavy loads. They also often choose to engage in academic subjects on Saturdays when they’re bored, so I never worry about hitting the minimum the law requires. This built-in extra time is especially important with high school approaching, as there are many life skills that teens need to learn along side of academics. This also gives the adults time to run the five home-based businesses that we run, and gives the kids time to be kids and also begin learning business skills. Last week we look at the basics on quinoa and how to soak and cook it. Today, let’s look at some family favorite ways of fixing it. When I went gluten-free, I had just discovered couscous and was enjoying it. Since couscous is a wheat-based pasta, it was totally out after going GF and at the time I couldn’t find a replacement for it. Later, I discovered that quinoa was the perfect GF substitute for any recipe calling for couscous. Quinoa’s slightly bitter, slightly earthy taste pairs exceptionally well with chocolate or fruits. Ground into flour and put in chocolate cookies will work well. Or cooked whole, chilled until cold and tossed with fruit. I sometimes add dried fruit to hot quinoa pilafs, such as dried apricots, as they pair well together. My Quinoa Cranberry Pilaf is a good example of how to pair sweet and bitter. It’s an excellent sweet and savory dressing replacement and we enjoy it at Thanksgiving and Christmas, however I use it year-round as a side dish. Last year, as I tested multiple recipes for the Christmas mailer, I quickly fell in love with this sweet and savory dish. We ate it for that meal, but the next day I reheated it for lunch and it took on a crispy crust that was awesome. So if you like a crisp, browned crust and a tender inside, spread this in a baking dish and pop it in the oven at 350 degrees until the top looks rightly browned to you. I promise it won’t disappoint! In a bowl, combine the quinoa, water and 2 Tbs lemon juice. Stir and cover. Soak 24 hours. Drain and rinse thoroughly. Set aside. In a saucepan, heat the coconut oil over medium-high heat. Add the onion and celery and cook until tender, about 5 minutes. Add the quinoa, stock and salt. Stir, bring to a boil, cover, reduce heat to low and cook until the stock is absorbed, about 20 minutes. Uncover and cook an additional few minutes to drive off extra moisture, if needed. Transfer to a mixing bowl and stir in ½ Tbs lemon juice and the remaining ingredients. Taste, adjust seasonings, and add the extra ½ Tbs lemon juice, if needed. Can be served warm or at room temperature or spread in a pan and cooked at 350 degrees until the top is lightly browned. This post is part of Soaking Grains Gallery. As a new feature on Cooking Traditional Foods, every Wednesday afternoon we’re going to feature one of our most popular posts from the past. There are many great articles and recipes in the archives and we hope you’ll find some new favorites. I have tried and tried to make sourdough the ‘traditional’ way, in the way Nourishing Traditions describes in its sourdough recipe. I have let my starter sit out and fed and stirred it faithfully, time and time again, only to have it get moldy and fail after a period of time unless I kept it in the refrigerator. Maybe it’s because I live in the humid South, who knows the reason. But I have never been able to get sourdough to the point where I could bake with it and have it out on the counter so I could produce enough to use it daily. Keeping it in the fridge just resulted in too many jars to be able to keep up with the demand of daily baking, it soured so slowly. That is, until I tried the method Lozt Nausten, one of the moderators on the CTF forum, recommended in her wonderful sourdough bread recipe. If you are gluten-free and you need a regular bread, I strongly suggest you look at her four versions of sourdough, including the grain-free and egg-free versions. I have tried every version of her recipe and have enjoyed them all. Using kefir made with apple juice instead of water to make the sourdough starter speeds the process up considerably and gives the starter a major boost of beneficial bacteria to ward off mold. You can use the starter in as little as 24 hours if you want a very mild flavor. Allowing it to go longer while feeding it daily creates a stronger sourdough flavor. You can use any fermentable flour to make sourdough. Nuts and starches, like coconut, almond, tapioca starch and the like, will not ferment and can not be used for the starter but they are fine as an ingredient in the dough. If you need a grain-free starter, you can use bean flours to make your starter. 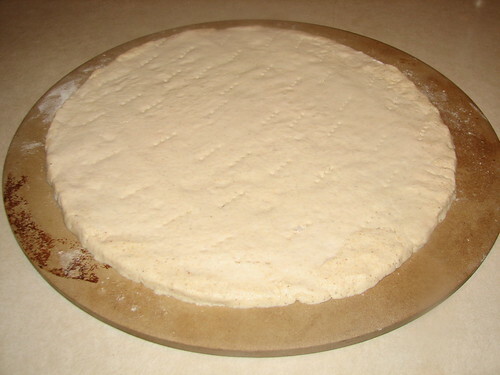 In fact, on Lozt Nausten’s blog, you’ll see a grain-free recipe that uses bean flour to make the starter. To make your starter, combine equal amounts of a flour of your choice and apple juice kefir. 2/3 cup flour and 2/3 cup apple juice kefir makes 1 cup of starter. Leave it on the counter for 24 hours. If you need a mild sourdough, use it to bake at that point. If you want a stronger flavor, feed it more and let sit longer. If you need to take a break from using the starter, stash it in the fridge and feed it once a week. I use my starter to make pancakes, pizza, bread and much more. In the coming weeks, we’ll be going over a variety of recipes and techniques to help you add sourdough to your meals. I’m often asked how I got through an extended illness with two small children to care for, alone, for just about 24/7. Hubby was home only one or two days a week when I was sick. I pretty much had everything on my own and for a large part of it, I was either vomiting 24/7 or the first half of the day. My oldest was 1.5 when I went through hyperemesis with my son. Then they were 1.5 and 3. 5 when I became seriously ill for a couple of years with celiac. Here’s what I did in an effort to cope.